Profoundly deaf, Peter John Rozynski doesn't have clear speech, and prefers to communicate through signing or writing. Nonetheless, he's managed to carve out a successful career as a softball umpire in the West Palm Beach, Florida, region, on youth, teen, adult, and collegiate levels—and to do an outstanding job. He was deafened when he was 2 years old, from ototoxic medicine administered to treat a recurrent ear infection. His oldest brother, Ronald, was also deaf, and the two attended the Bruce Street School in Newark. Their mother already knew sign language, so “we all understood each other.” He transferred to the New Jersey School for the Deaf in West Trenton, and took a job at New Jersey Bell, working his way up to a management position. New Jersey Bell became Bell Atlantic, then Verizon; he was there 31 years. In 2002, after 31 years there, he was offered early retirement. He'd been out of school for 35 years, and despite his extensive work experience, knew that a college degree was essential for a second career. At Union County College in Cranford, Rozynski was active in the UCC Sign Club and ASL Festival Planning Committee. He tutored ITP and Deaf Studies students, and held part-time positions. On May 24, 2006, he received his Associate of Arts degree in ASL and Deaf Studies. He was a sprightly 53. 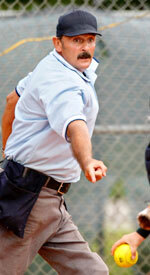 He began working as an umpire for junior-varsity and fast-pitch softball leagues in 1998, and has continued ever since. He explains that he was motivated by the unhappy spectacle of seeing umpires “make a ton of bad calls,” trying to hurry the game along to get it over quicker so they could take their paychecks and go home. He believed that he could do a better job, with integrity. He was concerned about being accepted in umpiring school, but survived. One of around 35 deaf umpires in the nation, Rozynski, who now lives in West Palm Beach, Florida, umpires around 175 games a year. He's respected and liked by players, coaches, fans, and other umpires. He has a well-earned reputation for fairness. Communication lapses occasionally happen, and he takes them in stride. He's noted for the clarity of his calls—naturally, with all that expertise in ASL and his experience on the field, his calls are emphatic and readable from afar. He's also noted for his thorough understanding of the rulebook. The heckling of fans, which can be so disconcerting to a hearing umpire, doesn't bother him in the least—he can’t hear it. It is a pleasure to work with Peter. He is an outstanding official, and a really good guy. During clinics it is sometimes difficult to facilitate his instruction because an individual who can sign is not always available. When one is available, he/she may not completely understand the umpiring concept. And, of course, additional costs are required that have no funding, especially if the group is voluntary or has small dues. Because of this, I have been pleased to share extra time with Peter. He trust me, knows my experience, and I understand his passion to be the BEST HE CAN POSSIBLY BE. I am glad to offer this extra attention. Peter has no hesitation to ask me anything. We usually can get a complete understanding through charts, field drawings, notes to one another and a llot of head shaking and gestures. We have traveled together . . . which can be tough because we enjoy communicating. This is difficult as one of us is driving and eye contact, note writing and gestures do not mix well at 70 mph. The only issue with Peter on the field involves hearing. In a three-man rotation, partners verbalize as they run to or away from a play. During these times umpires (who are moving on the field) use their ears as much as their eyes. Sometimes an umpire is required to have his back to another official during these communications. Likewise, some situations require hearing MORE than sight. For example, if a fast ball is up and in on a batter and the catcher moves with the pitch, the plate umpire would have little or NO opportunity to SEE if the ball a.) hits the bat, b.) hits the batter, or c.) hits the catcher’s glove. The result of the play is very different. The field umpire may not be in a position to assist. I have worked with one other deaf umpire. He also does a very good job. Rozynski uses his umpiring as a way to educate the public that Deaf people can hold “untraditional” jobs, and do them well. He tells us that he has one as-yet-unfulfilled ambition: to umpire an ASA national tournament.